- Reading and note taking rom Kari Chapin's great book Grow Your Handmade Business. I really enjoyed this and its motivated to me to carry on with my business and get all the "boring" bits well organised! - Sketching for this week's Wise Words post. 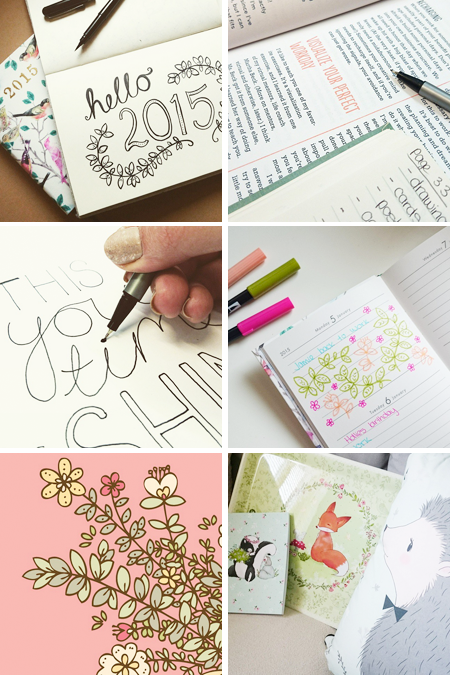 - Attempting a new mini-project where I try to doodle something in my diary every day. By the end of the year this should be pretty fun to look back through! - A little preview of one of the new designs. A lovely lady on Instagram used this as inspiration for some nail art! - A few weeks ago I won a $100 gift card to spend at the lovely Micush Etsy store (I won it as part of Decor8's #12DaysofGiveaways) and this week my chosen goodies arrived! I definitely reccommend checking out the shop, its all a great quality and the illustrations are beautiful.